HONG KONG (AP) — Asian and European stock markets were moderately higher and the dollar retreated Friday as the threat loomed of a U.S. federal government shutdown. KEEPING SCORE: European shares were higher in early trading. Germany’s DAX rose 0.4 percent to 13,334.81 and France’s CAC 40 was up 0.1 percent to 5,500.45. Britain’s FTSE 100 gained 0.1 percent to 7,701.11. Wall Street was poised to open higher. Dow futures added 0.1 percent to 25,968.00 and broader S&P 500 futures inched up less than 0.1 percent to 2,797.50. SHUTDOWN: U.S. House lawmakers voted for a stopgap funding bill to keep agency doors open and federal workers at their jobs until mid-February, but Senate Democrats and some Republicans were expected to block it on Friday. A shutdown could hurt consumer spending and rattle markets, though it’s unlikely to cause widespread economic damage, Credit Suisse economists said in a note on Thursday. GLOBAL OUTLOOK: Most Asian stock indexes posted gains for the week, with benchmarks such as the Hang Seng near record highs driven by optimism over the global outlook and corporate earnings. Next week brings a raft of economic data along with meetings by the Bank of Japan and the European Central Bank. ASIA’S DAY: Japan’s benchmark Nikkei 225 edged 0.2 percent higher to 23,808.06 and South Korea’s Kospi gained 0.2 percent to 2,520.26. 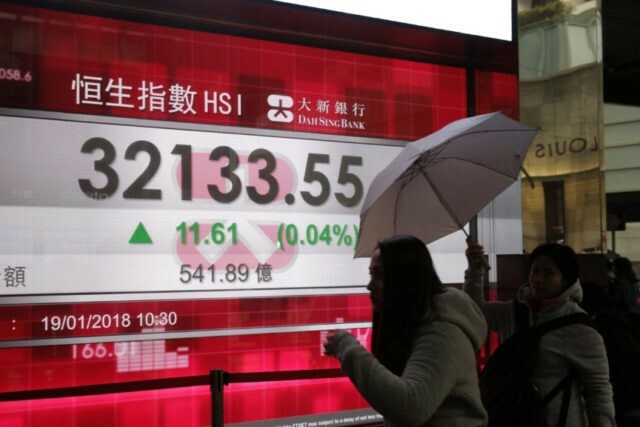 Hong Kong’s Hang Seng ended 0.4 percent higher at 32,254.89 while the Shanghai Composite in mainland China added 0.4 percent to 3,487.86. Australia’s S&P/ASX 200 dipped 0.2 percent to 6,005.80. Shares were mixed in Southeast Asia and Taiwan’s benchmark rose. CURRENCIES: The dollar weakened to 110.60 yen from 111.07 yen in late trading Thursday. The euro strengthened to $1.2280 from $1.2237. ENERGY: Oil futures retreated. Benchmark U.S. crude lost 62 cents to $63.33 a barrel in electronic trading on the New York Mercantile Exchange. The contract dipped 2 cents to settle at $63.95 a barrel on Thursday. Brent crude, used to price international oils, sank 63 cents to $68.68 a barrel.